Barnton House: A large mansion house, built in a castellated style, not exceeding three storeys in height. It has two towers, one on the S, and the other on the E side. 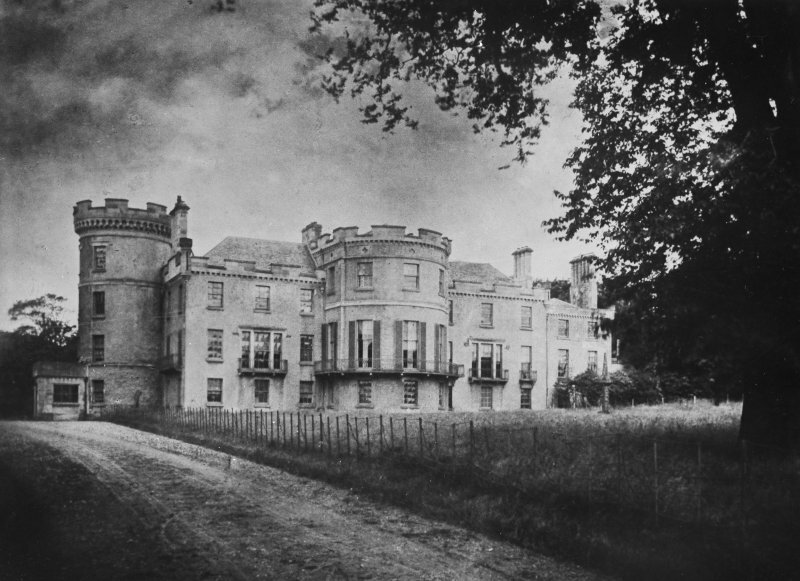 It first became the seat of Lord Balmerino in 1623 (MacGibbon and Ross state it was built by him in that year). Part of that building still remains, and considerable additions were made in 1683 by Sir Robert Milne. According to some ancient charters, this was the hunting seat of the kings of Scotland, at which time it was called "Cramond Regis". Site now occupied by the garden of a modern house; no remains visible. Two sundials and a number of carved stones, all apparently of 17th century date, which are said to have come from Barnton House, are preserved in the grounds of Sauchieburn House (see NS78NE 8). This Barnton House is really Cramond Regis, the first Barnton demolished c.1800. ARCHITECTS: Robert Adam. Design for a new house. Design for adds to L plan house. David Hamilton addition to original house. Demolished c.1920. Information from Demolitions catalogue held in RCAHMS library. In 1718 Earl of Rutherglen proprietor of Barnton aquires Kings Cramond. Both estates purchased by William Ramsay later 18thC. Kings Cramond altered by R Adam to form seat for his son George after which Barnton House was demolished leaving Kings Cramond as Barnton House on the combined estate. Wright work at Barnton House. The kirk session in its report on Cramond Kirk notes that William Whittet, Wright, has been employed at making improvements at Barnton House. Cashbook in which are noted sums paid to tradesmen. The payments are for repair work and upkeep of Barnton House, Bonnyfield Lodge, Drylaw House and Gogar House. New stables are built at Barnton and cottages at West Pilton. Report on the condition of all buildings on these estates. Additional notes on expenditure on improvements. 1. Making the West Approach. 2. Reclamation of 2 acres of ground. 3. Removing the ruinous houses of the village of King's Cramond. 4. Planting and fencing a belt of six acres along Queensferry Road. 5. On advice of Mr Burn, the chimneys are to be raised. 6. Completion of the Ice House. Total cost amounts to 620 pounds. Details for Mr George Ramsay. Notice of sale of Barnton Mansionhouse. The house is described as large and handsome with offices that include a Riding School, Hay loft, Byre and 4 cottages. The Garden contains Conservatory and extensive Vineries. Outline lay-out of the mansionhouse on a plan of the ground to be feued to Cargilfield School. West approach to Barnton House. The work has been completed at a cost of 301.13.6 1/2. Complaint that insufficient earth has been removed on the North and the East to give a view of the park from the dining room. This will require a further outlay of 100 pounds to put right. Principal part built 1681 by Sir Robert Milne. At the N.W. corner is part of the mansion built by Lord Balmerino with the date 1623 on one of the windows. Adjacent to this and on the North is a chapel built in 1770 by Lord and Lady Glenorchy. The paper is submitted for revision by (John Small) Librarian of Edinburgh University. Proposed report on the condition of Barnton House. Letter from Charles Reid, Architect, concerning arrangement for the necessary inspection. Advertisement of sale of Barnton House. It gives particulars of the mansion house, outbuildings, cottages and gardens. Asking price is 102,000 pounds. Contents of previously locked room at Barnton House. Letter from Col. Murray, by which he makes secret arrangements to gain access. The condition from John McIntosh, forester, that the chimneys at Barnton House are choked up with daws' nests because there have been no fires for a dozen years. In addition the glass 'copely' above the lobby is leaking. Sauchie and Bannockburn 'Old plans'. 'Generally small'. Old Barnton. 'Interesting but of no use'. Demolition of Barnton Clock Tower. 1. Letter to Sir James Maitland from Charles S. Murray. It accompanied a sketch by Mr Buchanan and an estimate for repairs. 2. Note from Sir James Maitland. He wishes the tower demolished and the clock stored at Sauchie. 3. Letters from John Buchanan. He accepts Mr Wilkie's offer to take down the tower. Stones are to be kept. Mr Ritchie, clockmaker is to advise about clock. Proposed demolition of Barnton House. Letters concerning unsuccessful attempts to rent the house. In 1908 lead had been stolen from the roof and by 1920 the house is so dilapidated that Arthur Steel-Maitland suggests that it should be demolished although he wishes to reserve and fireplaces, doors and panelling of real worth. NT 18867 75812 An archaeological evaluation was undertaken on 4 June 2007 prior to the proposed development of 31 Barnton Avenue West. The site is situated to the immediate E of Barnton Lodge, in the grounds of which stood the now demolished Barnton House (Cramond Regis). The evaluation consisted of three trenches totalling 34m2. The evaluation revealed a substantial 2.0 m section of double coursed sandstone wall and an abutting sandstone floor. These features are probably associated with Barnton House. Funder: Richard Hall Architecture Design on behalf of Mr and Mrs Lam. Information from Rob Engl (AOC Arcvhaeology Group) 2007. NT 18867 75812 (centred on) Work was undertaken 18–25 February 2008 in advance of redevelopment. The work aimed to excavate features recorded during a previous evaluation in 2007.
enclosing an area of 90m2. A narrow brick drain of probable late 18th- to early 19th-century date cut the W, N and S walls. The structure, possibly a kennels or agricultural building, may be 17th-century and is probably associated with the site of Cramond Regis. A large culvert with overlying wall, also of sandstone, lay to the NW of the structure. An associated section of wall aligned N/S overlay the NW corner of the putative kennel / agricultural building and is later in date. These walls probably relate to the SE corner of the later Barnton House. A limited number of artefacts were recovered. These consisted of ceramics including a single sherd of green glaze pottery and a copper button.